Ultrafiltration(UF) membrane functions as the core part of the whole system to produce mineral water. Ultrafiltration (UF) membrane serves as a molecular sieve. It separates dissolved molecules by passing a solution through an infinitesimally fine filter. The ultrafilter is a tough, thin, selectively permeable membrane that retains most macromolecules above a certain size, including colloids, microorganisms and pyrogens. Smaller molecules, such as solvents and ionized contaminants, are allowed to pass into the filtrate. Mineral water is water containing minerals or other dissolved substances like calcium, magnesium, sodium, potassium, silica and bicarbonates, which is healthy to drink. Our water treatment systems are customized and designed to meet the local water conditions and flow rate requirement. The mineral water treatment equipment utilizes a quartz sand filter, active carbon filter, and PP filter for the treatment of raw water. This process not only removes large particles, odor, color, and some bacteria, but protects back-end UF membranes, which helps prolong the life of the equipment. The ultrafiltration(UF) membrane functions as the core part of the whole system to produce mineral water. Ultrafiltration (UF) membrane serves as a molecular sieve. It separates dissolved molecules by passing a solution through an infinitesimally fine filter. The ultrafilter is a tough, thin, selectively permeable membrane that retains most macromolecules above a certain size, including colloids, microorganisms and pyrogens. Smaller molecules, such as solvents and ionized contaminants, are allowed to pass into the filtrate. Thus, UF provides retained retentate that is rich in large molecules and a filtrate that contains few, if any, of these molecules. When choosing filter materials, we offer tailor-made solutions in view of corrosion, pressure, vibration and temperature, as per raw water conditions of customers. For example, if TDS of raw water is too high, fiber glass filter tank will be recommended in order to optimize the whole water treatment system. 1. Mineral water treatment equipment is able to effectively remove most particles, pyrogens, microorganisms, and colloids that are above rated sizes. Some calcium, magnesium, sodium, potassium, silica and bicarbonates are remained in water. 2. It produces high quality water with the least amount of energy. 3. We provide tailor-made mineral water treatment equipment in accordance with raw water condition and your specific requirements. 4. The water treated by our mineral water treatment equipment tastes sweet. Specializing in manufacturing Ultrafiltration Water Treatment System in China, Angel Drinking Water Equipment Company provides a range of water purification equipment with complete models. Meanwhile, we also provide water bottling equipment, water filling equipment, wrap shrink packaging machine, and more. Our drinking water equipment has received CE, ETL, UL, and BSI certificates, and is now popular in over 30 countries and regions, such as Mexico, Australia, Canada, Indonesia, India and France, to name a few. If you are in need of the drinking water equipment, please feel free to contact us and try our products. We at Angel are confident that you will be satisfied with your purchase. Ultrafiltration is used to treat drinking water:it improves the quality and shelf life of the water.Ultrafiltration is using hollow fiber filtering technology, with three levels of pretreatment filtering to remove impurities in the water; ultrafiltration pores less than 0.01 microns, can be completely filtered water, rust, bacteria colloidal and other harmful substances, retain the water on the human body useful trace elements and minerals. Ultrafiltration is a membrane separation technology, i.e., under a certain pressure,made the small molecules of solute and solvent through certain pore size special membrane,super and macromolecular solute impermeable membrane,left side. Ultrafiltration principle is a membrane separation process principles, ultrafiltration using a pressure activated membrane, in the external driving force ( pressure ) under the effect of colloidal particles in water interception, and the relatively higher molecular weight material, and water and small solute particles through a membrane separation process. Through the membrane surface of the microporous filtering may be cut-off molecular weight of 3×10000 – 1×10000 material. When the water to be treated by external pressure to flow through the membrane surface, the water molecules and the molecular weight of less than 300 – 500 of the solutes through the membrane, rather than a hole of the membrane microparticles, large molecules such as sieving action are retained, thereby allowing the water to be purified. That is to say, as the water passes through the membrane, the water containing colloidal silica to remove most, at the same time can remove large amounts of organic matter. 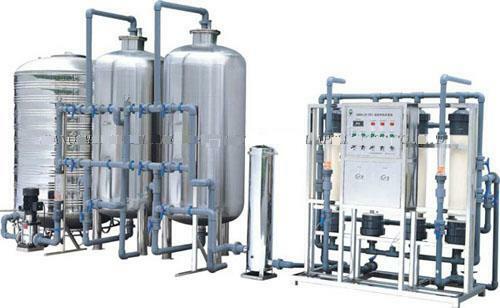 Water pre-treatment system: Quartz sand filters, Activated carbon filters, Precision filters;Chemical dosing machine. Supporting of the mineral water treatment systems: The electrical control system. Supply & Drain system:Supply auxiliary equipment to the water treatment room, water pressure ≥0.2 Mpa, water usage: 4M3 / h, there should be room to leakage and drainage gutter.